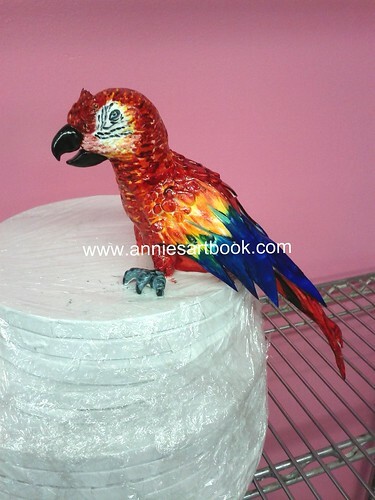 Annie's Art Book- Cakes: Fondant parrot, fondant palm, fondant waterfall, fondant Mom. 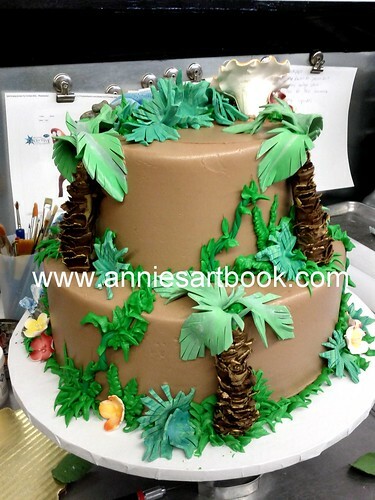 Fondant parrot, fondant palm, fondant waterfall, fondant Mom. 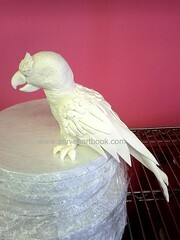 So, I started with the actual cake first, then I went to work on the parrot. 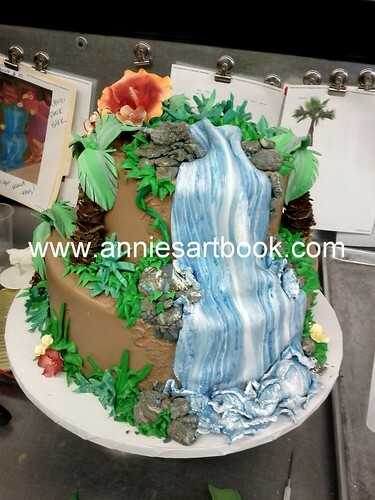 I have never made a waterfall from fondant before, but the ones I've seen always looked too stiff for my taste, just marbleized fondant in blue. I wanted it to look more realistic. So, I printed pictures of waterfalls. Real ones. 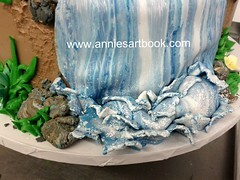 I wanted white foam, splatter, white, lots of white. You would not believe how much white there is in waterfall water! 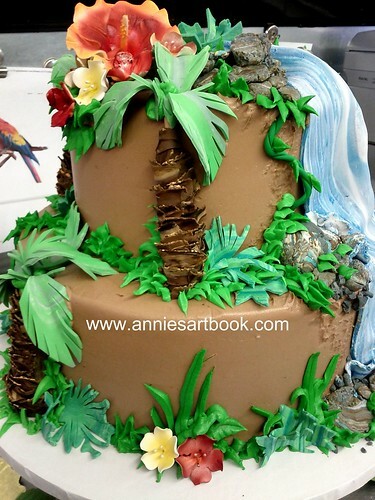 I don't know why, but it helps me more to look at pictures of real things that I have to recreate out of fondant, than to look at fondant replicas of the same things. That is the back. 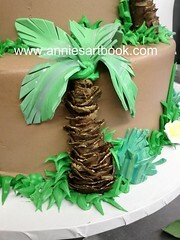 I am mighty proud of these palms. Yes, I looked at real pictures for these too. 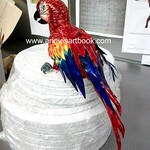 How about that parrot you would ask? Coming right up! I had so much fun coloring him too! 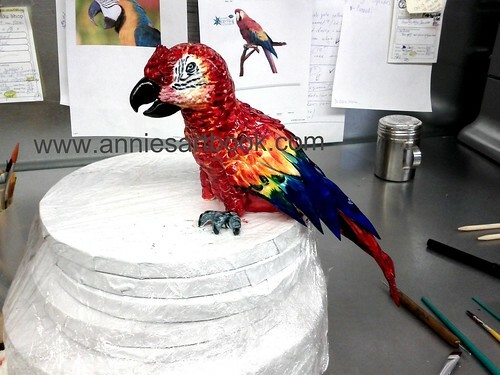 I'm a sucker for birds. It just comes so naturally when I start making them! 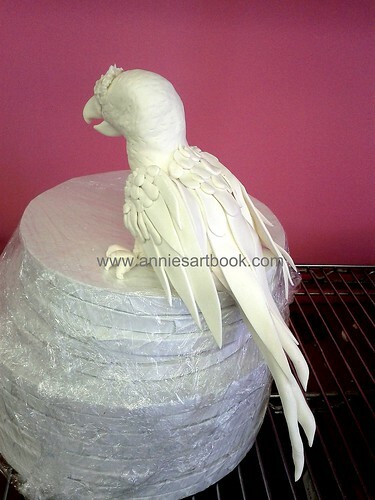 You probably remember my Firebird cake? 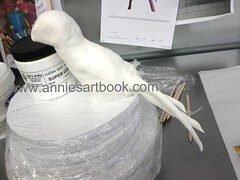 Unfortunately, as it happens with most of the cake decorations I make, I couldn't see the finished cake, but if someone at the bakery remembered to take a picture for me, I'll definitely show you how it looked like. 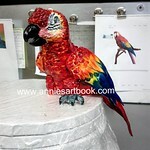 I hope you enjoyed my little parrot story as much as I did making it! 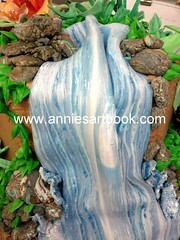 P.S: What about the Fondant Mom from the title? Oh, yeah! 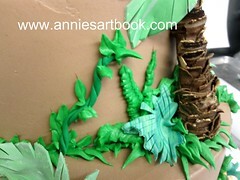 I almost forgot, my daughter started calling me Fondant Mom. :-) Cute, right? Ани, страхотна е, папагала е като истинси! Благодаря, Танитка! Хубаво е, като от време на време има как да си поиграше с проект, иначе все бързане, бързане, а тази с удоволствие си я направих. Да, когато имаш време наистина е удоволствие! Thank you, Alice! 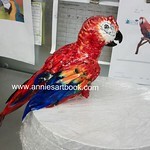 :-)I quite like it myself. Изглежда прекрасно! А от къде си си купила инструменти за фигурки?